(Phys.org)—When physics graduate student Jesse Silverberg took his girlfriend to a heavy metal concert, he didn't dive into the mosh pit as usual. He hung back and observed that humans act like particles, dancing into "collective motion"—from which models could provide insight into panicked crowds. Silverberg quantified the motions of moshers with fellow student and metal fan Matt Bierbaum for a project in the advanced statistical mechanics class of James Sethna, Cornell professor of physics. They discovered that the moshers' behavior, like flocks of birds or gas particles, can be predicted with simplified theoretical models. "If you want to understand how people behave in extreme conditions, this provides a good lens to start looking at human collective behavior," Silverberg said. 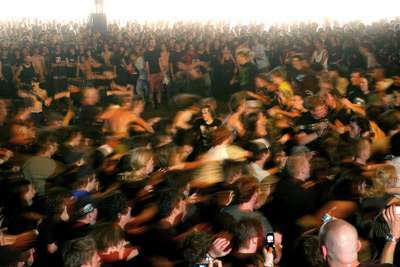 For their experiments, the researchers downloaded YouTube videos of moshers moshing and used automated tracking techniques employed in associate professor of physics Itai Cohen's research group to quantify the crowd's motion. Their scientific criteria for choosing YouTube videos: "The least shaky." To understand what they were seeing, Bierbaum created a computer simulation based on the notion of "flocking," which is what happens when particles—or in this case, humans—tend to follow each other. He also made an interactive version of the simulation, in which different parameters like "noise" and "flocking" can be tuned. Their simulations consisted of two types of moshers, which they dubbed Mobile Active Simulated Humanoids, or MASHers. Active MASHers move around with a tendency to follow their neighbors, so they tend to flock. Passive MASHers remain more stationary—mimicking concertgoers who prefer not to risk injury. Mixing these populations together, the researchers found that when random collisions dominated the tendency to flock, the result was a run-of-the-mill mosh pit. But when flocking dominated random collisions between moshers, a more ordered, vortex-like state emerged. This reminded the researchers of "circle pits"—a subset of mosh pits in which participants turn into a human collective whirlpool. The attempt to quantify moshers in a mosh pit isn't just for fun—they're looking to get published. Ever since their paper was uploaded to the arXiv, they've received lots of attention for their unusual experiments. Furthermore, the students hope their work can provide insight into how a crowd of humans might collectively move in an emergency situation—running from a burning building or an earthquake, for example. Experiments of human motion in crowds have previously been attempted, but the situations are typically contrived and certainly not panicked, Silverberg said. Heavy metal concerts are more like these panic or riot situations in terms of the collective motion of the participants. "We see the analogy with the experiments, and we have a sense that we are on the right track for how people behave in these situations," Bierbaum said. The dance of the cells: A minuet or a mosh? For Ex., Each one entering a crowded space...eg mall, exhibition etc should be sprayed with 1 or 2 uniquely identifiable particles and cameras should monitor movements & interactions of those particles until persons exit the area for good. Combined with their IDs ...scientific authorities that can responsibly access them...along with their cell phone nos (containing their physician Info) should be able to come up with some NEW Futuristic Results.